I have seen people say that dehydrated grains are harder to keep alive, or harder to “wake up”. If that is the case, then they most likely were not dehydrated properly. In order to preserve the qualities of the bacteria and yeast, and have them go dormant with out killing them off, they should be dehydrated in a dehydrator with no heat. It’s not that hard to do, but still it needs to be done this way. 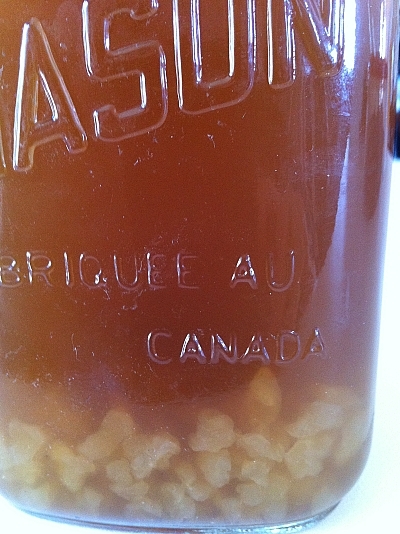 If your water kefir grains are properly dehydrated, and you follow the easy instructions for rehydrating them and brewing your first batch of kefir, you will have live active, happy, water kefir grains in as little as 3-4 days. If you have ordered dehydrated water kefir grains, they will arrive packaged in a ziplock bag and shipped in a padded envelope for a safe journey. When they arrive, if you can not make your kefir immediately, place them in the refrigerator. They should be safe there for several months (up to a year or more). #1- Gather your ingredients. 1/4 C of your sugar of choice. Here I have organic brown sugar. Lemon or lime slice. Peeled if it isn’t organic Unsulphured dried fruit. 3 Cups water. Minerals-liquid minerals, pink himilayan salt, a cleaned egg shell piece (any 1 of those will do)…and only needed if you are using distilled water stripped of minerals. Here I am using just a few drops of Concentrace liquid minerals purchased at my local organic “health food” store. You will also need a glass jar, coffee filter and ring lid or elastic band for cover and wooden or plastic stir stick. A NOTE ABOUT WATER: If you are using bottled water you absolutely must read the ingredients on the back label. Just because it is called “Spring Water”, that does not mean nothing has been added. Natural spring water will have minerals, and may have a slight amount of naturally occurring fluoride. It should not have any chlorine. Do NOT use ozonated water. Ozone is added to kill bacteria. See here for reference. Do NOT use alkaline water (kangen water etc). 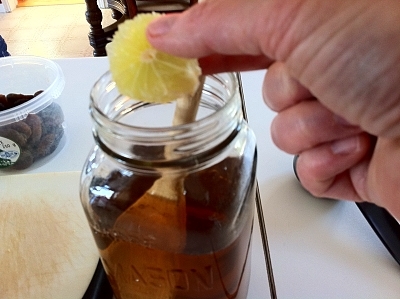 We add lemon or lime to give the water a slight acidic edge. 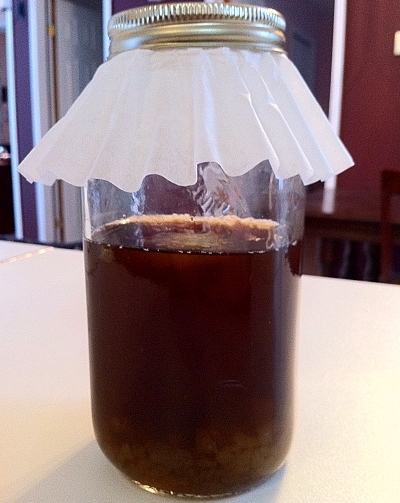 The act of fermentation increases the acidity of the brew. An alkaline environment will encourage an imbalance of bacterial growth and you could end up with some nasty bacterial contamination! 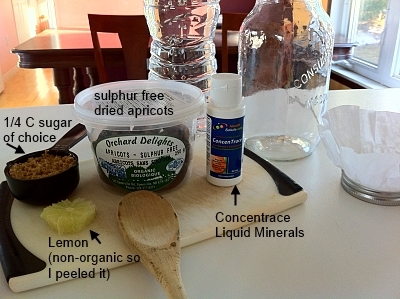 #2- Mix all ingredients, except water kefir grains, in the glass jar. Stir well to dissolve the sugar. 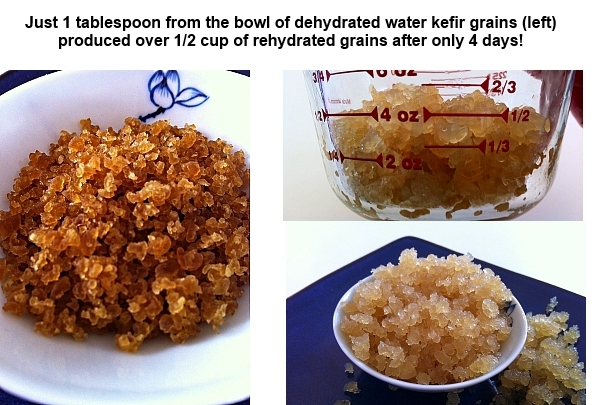 #3- Add 1 Tablespoon of dehydrated water kefir grains. 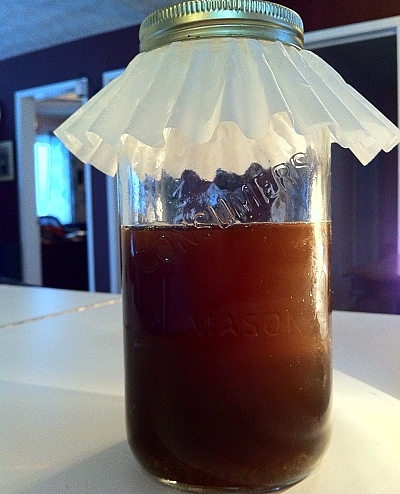 #4- Cover the jar loosely with a coffee filter, paper towel etc and secure it with an open mason jar ring, or an elastic. This allows gases to escape while keeping out flies and other unwanteds. Here is what it looks like 16 hours later. The grains are not just swelling. They are also growing as they begin to eat the sugars. After a long hibernation, your grains are hungry. Day #2- The grains have now been in their sugar water for nearly 48 hours. Notice there are a couple of grains starting to dance in the jar. This could start happening at any time in the first 4 days, and is a good sign. It means that the grains are beginning the fermentation process, and creating gases that cause the water kefir grains to float. Day #3- The grains are a little bigger now and the sugar solution is beginning to lighten. Day #4- Your dehydrated grains are fully hydrated now and probably have started to grow in a noticable way. The sugar water solution is quite a bit lighter than when you started. You may also notice tiny bubbles at the top of the liquid, and floating up from the grains on the bottom. You are starting to notice a “beery” fermented kind of smell. #5- It is now time to strain the kefir grains and start with your first ferment. 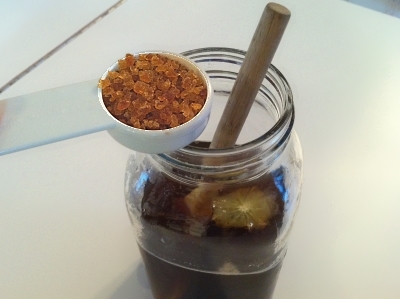 Using a non-metal strainer, strain the sugar solution off of the grains. Discard the lemon or lime, and the dried fruit. You can discard the liquid, or drink it. At this point it will have started to ferment, but it won’t be a fully fermented water kefir beverage. It will be more like a sugar/water solution with some probiotics in it. Still good for you if you don’t want to waste it! Now that your dehydrated kefir crystals are fully hydrated, you are now ready to create your first brew of water kefir. 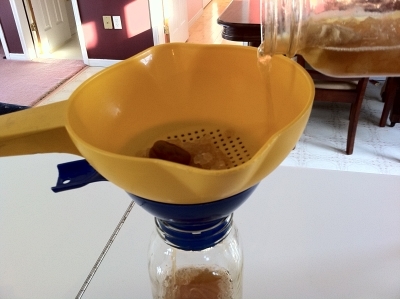 It’s time to go over to the water kefir brewing instructions. Here you can purchase dehydrated water kefir grains. I don’t understand what you mean when you are making it for diabetes and how bad will the sugar hurt me. Mine has grown mold by day five. It was kept in the same area as my husband’s Kombucha is growing Quite successfully. Hi Mandy You need to be changing the sugar water every day. Once grains have grown mold I do not save them. The dangers of mold are not worth the risk to me. You could always try to rehabilitate them, but I would not personally. This is in the first stage of rehydrating dry grains. It does not say anywhere to change the sugar water at all. I followed exactly as above. The grains themselves are not moldy there are very small mold bits floating on the top of the liquid. Is it possibly the close proximity to the Kombucha even though all the jars are covered with a coffee filter and elastic band? hmmm you are right! I apologize. I was not thinking dehydrated, I was thinking already rehydrated grains, but perhaps I need to revise a little. 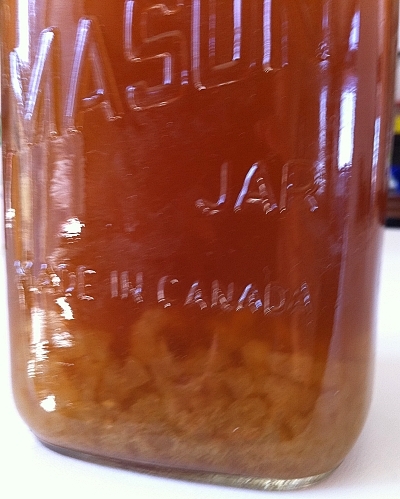 After a number of years of fermenting, I would never leave a jar 5 days without changing out the sugar water at least once, so it is a reminder to review other articles on the site as well! …. did you put the lemon in it as well? If it is just a few small bits floating on top, then skim them off, and start now on the page for fresh water kefir grains. 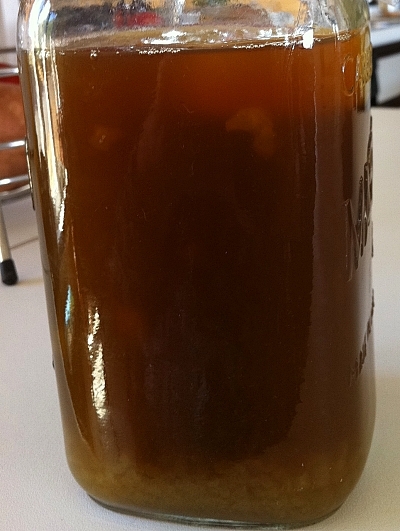 If it were cross contamination from the kombucha, you would likely see bits of kombucha scoby floating in your water kefir, but not mold. So yes I used peeled lemon slice & organic Unsulphured apricot. It has been very hot and humid this week we’re wondering if that could be part of the reason for the mold….? Or perhaps my lemon slice was too small. However I will proceed as Rehydrated And see what happens…..
Mandy I suspect the heat did contribute. Thank you for letting me know, and I revised my article. People like you help make the information better, so thank you so much for your questions! Can i use raisens? How much do I use? I willl let know what comes of it. I will use Dried Organic Cranberries which has apple juice concentrate and less than 1% organic sunflower oil if that is OK? Also, I would like to use palm and coconut sugar. Is that OK? This town has artisan wells and I filter with Big Berkey. I just want to make sure I don’t make any mistakes! Hi Marina All I can do is tell you what has worked for me in the past. Oil is typically not good for the grains. Palm sugar and coconut sugars seem to work for a while but you need to give them cane sugar every once in a while sunce that is the food they really thrive on. Let us know how you make out as you try these things. That way we can add to the knowledge bank for the next people who come along! While waiting for my dehydrated water kefir grains, I have read above recipe to wake them up. What a amount of unsulphered dried fruit do I use?. Also what would be a good substitute as I live in a small town and do not have access to a lot of organic and raw items. Hi Julie I use 1 apricot, so the equivalent in any dried fruit will work. There isn’t any sub for the fruit. You should be able to find some kind of preservative-free dried fruit in any grocery store. I guess one could always dry their own! Good luck!! !